How Much Does it Cost To Fly To Tucson? The cheapest flights to Tucson found within the past 7 days were $132. Prices and availability subject to change. Additional terms may apply. Liberty Intl. - Tucson Intl. Salt Lake City Intl. - Tucson Intl. Tucson flights touch down at Tucson International Airport (TUS), located a short 8.5-mile commute north to downtown Tucson. Arizona is prime road trip country and several car rental services are available from Travelocity and TUS, which means you can pick up a set of wheels when you arrive for use during your stay. Alternatively, take a taxi from the cab stand outside the baggage claim area. The airport is also a part of the city's Sun Tran public transit service; you'll find the bus stop to the west of the main terminal. 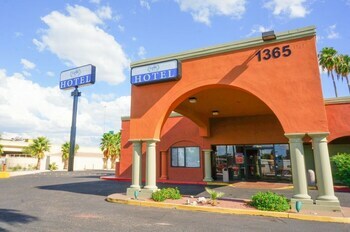 Some Tucson hotels offer free shuttle services that meet Tucson flights to make sure you have an easy ride to your room, so check whether this is an option for you before you jump into a taxi to chase your next adventure. Loews Ventana Canyon Resort: Stay here for the perfect pairing of luxury and landscape. 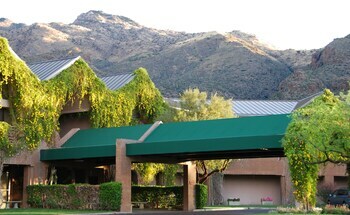 Close to the breathtaking Sabino Canyon on the north side of the city, this resort is for travelers who love to be outside, whether on the green or on the trail. Of course, staying in for a spa treatment or 24-hour room service sounds delightful, too. JW Marriott Starr Pass Resort and Spa: At this JW Marriott, all that glitters isn’t gold, but it does boast views of Golden Gate Mountain. 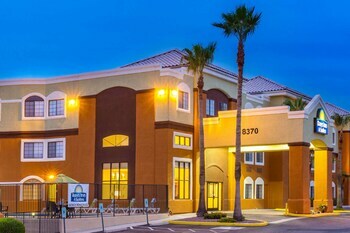 Breathe easy in the wide-open spaces of the Starr Pass neighborhood, and if you need a little help, the spa staff is ready to help you relax with signature body treatments, facials, and massages. Look out from your private balcony or get comfy in the understated elegance of Sonoran décor. 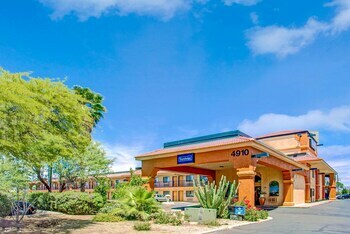 Westward Look Wyndham Grand Resort and Spa: Within 4 miles of several gold courses and natural wonders—Pima Canyon Trail and Tohono Chul Park—this elegant resort is a little bit secluded and a little bit in the middle of all the right activities. Beat any Arizona heat splashing around in one of three outdoor pools and dine in or take the hotel’s limo service for a spin. 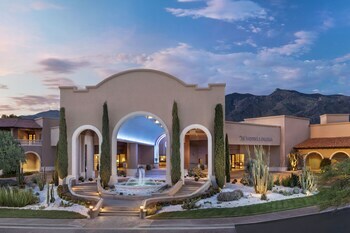 Hilton Tucson El Conquistador Golf & Tennis Resort: In Spanish, “oro” means gold, and the city of Oro Valley lives up to its moniker. Stay here, north of Tucson, for an easy drive to scenic Mount Lemmon. Amenities include a lush a peaceful golf course, 24-hour room service, a luxury spa, and three swimming pools. Tucson may be the second-largest city in Arizona, but it has warm small-town vibes despite the sprawling Sonoran landscape. Gorgeous scenery and exciting activities are all over the map, but to play near TUS, look for things to do on the south side of town. Of course, with an airport just 8.5 miles away, almost everything is an easy drive from TUS. Pima Air & Space Museum: If flights to Tucson, AZ have you curious about the history and engineering behind modern aviation, you don’t have to travel far from the jetway to learn more. Stand in awe of this stunning aircraft collection, which includes the world’s smallest bi-plane and supersonic spy planes. Mission San Xavier del Bac: Built during the late 18th century, this mission is still a place of worship today. Whether you feel an affinity toward the Catholic faith, you’re welcome to visit this beautiful work of architectural fusion that brings together Native O’odham adobe building techniques and Spanish-influenced aesthetics. Old Tucson: West of downtown, Old Tucson sits among the mountains as a nostalgic oasis of the Old West. Horse-drawn stagecoaches still rumble down the street and historic homes have been restored to their mid-19th century likeness. The vintage vibes of the American Southwest are wooing you. Book cheap flights to Tucson with Travelocity’s price-matching guarantee and follow the sunset to your destination. Quiet, no slamming doors even though it was a full house. Breakfast could use another waffle maker considering crowd in the am. It is a very fine property. The breakfast was wonderful.